On this day, three years ago, I did something entirely ordinary. I wrote a blog post. I’d been writing blog posts a few times a week for more than a dozen years by then, so it was nothing special. Only this time… it WAS special. Little did I know that millions of people would soon see that blog post (upwards of 4 million, but I really have no idea, since it appears in multiple places, online and off), that it would be translated into more than 10 languages, that it would be reprinted in a couple of magazines in different parts of the world, that the high number of visitors would crash my website, that it would be quoted in Harvard Business Review and several other lofty publications, and that it would be included in the curriculum for nurses in New Zealand and hospice workers in Canada (and others). Little did I know that it would open doors I’d never even imagined walking through, and would allow me to travel to and teach in countries I’d only dreamed of visiting. It is not hyperbole to say that that blog post changed my life. It catapulted my business and my reach far beyond what I’d imagined possible. It brought amazing people into my life from all over the world. It allowed me to lead the kind of retreats and workshops I’d been dreaming of. It was the catalyst that eventually saw me launching my Holding Space Coach/Facilitator Program (and also working on a book). It wasn’t all easy, of course. The sudden increase in demand on my time and energy meant that I got burnt out a few months later and had to see a therapist. I had to work through impostor syndrome, and lots of issues around whether I could meet people’s expectations of me. I had to learn new ways of working, had to work on establishing stronger boundaries, and eventually had to admit I couldn’t do it all alone and hire an assistant. I’ve often said about that blog post that “I gave birth to it, but then it went and lived its own life in the world completely separate from me.” Nearly every day, I hear a new story of where it’s popping up, where it’s being quoted, and what language it’s been translated into. Like a proud mother, I smile and nod and send it good wishes in its travels. What I hear, again and again, is not that I taught readers something new, but that I gave language to what they intuitively sensed was needed. I was not an inventor when I wrote that blog post, or even an originator. I was a catalyst – a transmitter, a channel. I was transforming the ideas that I’d gathered over the years and the lessons I’d learned at my mother’s deathbed, wrapping them in language, and offering them as gift to the world. I am deeply grateful that I was chosen to do this work, and humbled that I was chosen to be the transmitter of this gift. I am deeply grateful that I accepted the invitation when it came. Just as any child will serve as a parent’s teacher, that blog post has offered me many lessons and gifts over these three years. Here are a few of them. 2.) The outcome is not my responsibility. This has been my mantra since the early days of my business and it’s been even more important to me since my post went viral. I cannot impact how many people will read my blog or show up at my retreats, but I can be faithful to the work that I’ve been called to do and keep showing up and giving my heart whether there are 2 people or 2 million. I cannot determine whether people will love my work or hate my work, but I’m still responsible for DOING the work because it’s what I’ve been called to do. 3.) When I kept following the thread, eventually I discovered I had a whole tapestry. For the first several years of developing my business, I was unclear about my focus and unclear about what I should put my energy into. I had lots of ideas and tried lots of different offerings, but it often felt like I was fumbling in the dark. When this blog post came out, suddenly everyone wanted to talk to me about holding space, and there was part of me that resisted. “But… I have lots of other things to talk about! This isn’t ALL of my work!” And yet… once I surrendered to what was unfolding, I suddenly discovered that there was a thread weaving through all of my work and it WAS holding space. When I finally created the Holding Space Coach/Facilitator Program, I realized that all of my life, I had been preparing for this body of work and that it was ALL connected. Before I knew it, I had 418 pages worth of content, multiple videos, and enough ideas to start dreaming about the second level of the program. 4.) The only way I know how to talk about this work is to weave in social justice. At first, I thought perhaps I was taking a slight departure from my passions around social justice, but then I realized that if the space I hold has any value at all it HAS to be a space guided by a deep commitment to justice. If it’s not a just space than it is a shallow space, and I’m only interested in swimming in the deep end of this pool. For that reason, I will never apologize if my social media feed is full of stories and ideas around intersectional feminism, dismantling the patriarchy, bringing justice to the marginalized, etc. It’s all intertwined with how we hold space. 5.) Brave space has more value than safe space. For years, I focused on creating safe spaces for people – spaces where they could be vulnerable and authentic and where they could heal and not be judged. Gradually, though, I realized that safety for one might not be safety for another, and that for many, safety had become equated with comfort. If, for example, a person feels safe enough in a circle to reveal their deeply held racist views, then suddenly a person of colour in the same circle does not feel safe. When I learned the language of “brave space”, I made that my intention instead and made a personal commitment to work harder at ensuring safety for marginalized people in my circles than those from the dominant culture. When we hold space for each other, it means that we commit to even the difficult conversations. While safe space make keep us stuck, brave space helps us move forward. 6.) Good boundaries help me do a better job of holding space. Burning out a few months after the post went viral taught me an important lesson about boundaries. I had to cut back on how available I was to people, become less responsive to the thousands of emails in my inbox, and prioritize who I was holding space for. I was also going through a divorce at the time, so my priorities were my daughters and myself as we built a new life without their father living in the home. There may have been people I offended when my boundaries became more clear, but my family and mental health were worth more than what others thought of me. 7.) Radical self-care is critical for anyone who’s giving their energy away on a daily basis. My therapist helped me see how I was giving away little bits of my energy with every social media interaction, every coaching session, every deep conversation, every course offering, and every blog post. To sustain this suddenly more public platform, I had to invest in better self-care, and so I set out on a journey to find the best ways to support myself. I’m much better at it than I once was, but I’m still learning. 8.) The space we hold offers us endless depth and opportunities for learning. I am in awe of how much I’ve learned since I committed myself to this work and how much I still have to learn. Every week, I hold conversations with people from all over the world (six continents are currently represented in my Holding Space Coach/Facilitator Program) and in every one of those conversations, I feel like I’m being offered another clue to this endless puzzle about what it means to hold space and to be in deep relationships with people. I am convinced that I’ll never get to the bottom of this deep space, and that’s alright with me. 9.) Many of the clues to this endless puzzle come from cultures that are not my own and teachers that I’ll never meet. I remember, for example, how the Maori people in New Zealand introduced me to concepts from their culture and language that were closely aligned with what I teach but that offer nuances I hadn’t considered. I’m also learning things from the Indigenous people in my own country and from people in places like Zimbabwe and India. When I move away from the ethnocentric (and/or appropriative) tendencies that are common among white North Americans, I discover depth and possibility that delight and invigorate me. I will continue the quest and honour the teachers who offer me gifts. 10.) My work is only as good as the people I surround myself with. I have been blessed with incredible relationships and many of them have deepened over the past three years, since I committed myself to this work. There are my assistant and the team that supports me in my Holding Space Coach/Facilitator Program, for starters, but then there are also the people who invite me to teach and/or speak at their conferences and workshops, the people who host me and help me create beautiful retreats, the people who dare to dive into deep conversations and relationships with me in my courses and retreats, the people who share their beautiful stories with me, the people who challenge me to go deeper, and the people who cheer me on as i grow my work. I have endless gratitude for all of you. I thank you, my readers, for being among those people. I thank you for sharing your stories with me and for being willing to show up with courage and vulnerability. I thank you for your commitment to holding space for other people in deep, intentional, and just ways. I welcome you to share your own holding space stories on social media. Share what the article has meant to you, or share your own learnings from your life. 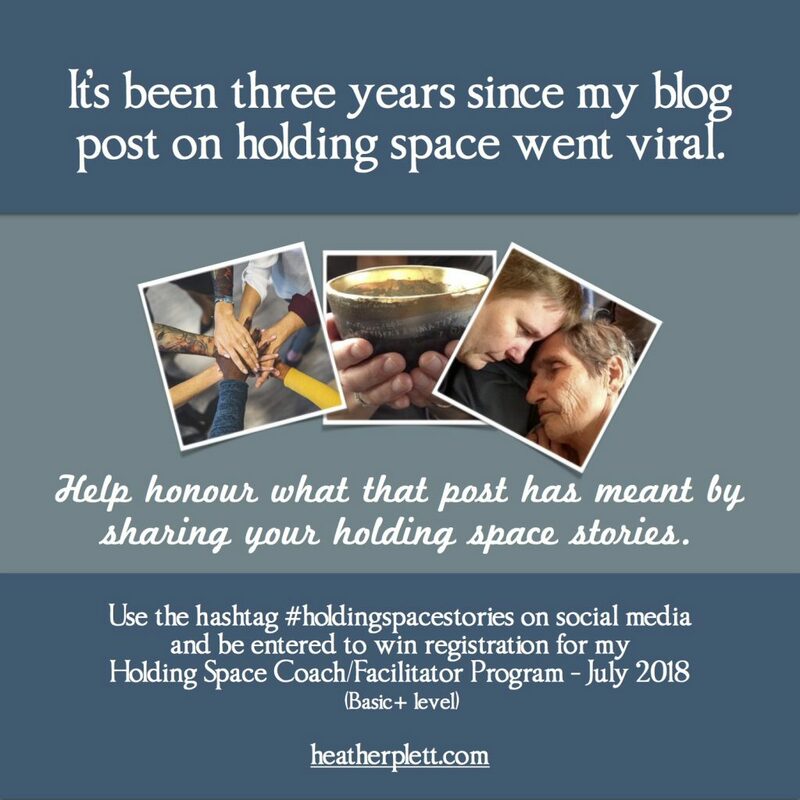 Use the hashtag #holdingspacestories and you’ll be entered to win free registration (at a Basic+ level) for my July 2018 offering of my Holding Space Coach/Facilitator Program. Share your stories before March 21st. The draw will be held March 22nd. Happy Anniversary! Thank you for 3 years of essential wisdom, Heather.